SALT LAKE CITY, UT – WAXIE Sanitary Supply’s Inventory Center in Salt Lake City earned The 2019 Outstanding Building of the Year (TOBY) award in the Industrial Office Building category in March. The award, which recognizes quality in commercial buildings and rewards excellence in building management, was presented to WAXIE by the Utah Chapter of the Building Owners and Managers Association (BOMA). Pictured from left: Alan Tomblin, CEO and President, NETWORK; David Wax, EVP, WAXIE Sanitary Supply and Chairman of NETWORK; Sharon Wax; Charles Wax, Chairman and CEO, WAXIE Sanitary Supply; Rick Hazard, VP of Marketing, WAXIE Sanitary Supply; Warren Noble, VP of Supplier Relations, NETWORK; Jeff Roberts, President and COO, WAXIE Sanitary Supply; Jim Fischer, VP of Business Development, WAXIE Sanitary Supply; Steve Thomas, VP of Corporate Accounts, WAXIE Sanitary Supply. San Diego – David Wax, Executive Vice President of WAXIE Sanitary Supply, has been elected by the Board of Directors as the Chairman of NETWORK® for a two-year term. David has held numerous positions within NETWORK over the past 25 years, including Vice Chairman, and has been active in various committees. Mr. Wax will lead the NETWORK Board of Directors and the NETWORK membership, aligning with strategic suppliers and key customers globally. Pictured from left: San Diego 2018 Account Consultant of the Year and 2018 Chairman Award winner, Brian Bogle, WAXIE Chairman & CEO Charles Wax. SAN DIEGO, CA, February 18, 2019 – On February 14th, WAXIE Sanitary Supply recognized San Diego based Senior Account Consultant, Brian Bogle with the prestigious Chairman Award during an event held at WAXIE’s home office in San Diego, CA. Each year the company recognizes the top Account Consultants from every branch that excel in representing their sales territory. The Chairman Award is then chosen from that group and is awarded to the consultant who exemplifies the highest level of achievement in a number of categories, including business development, account management and an overall commitment to servicing WAXIE’s customers. Christopher Saylor, General Manager, Jeff Roberts, President & COO and Mike Midas, Executive Vice President of WAXIE with the Sac-Val team. 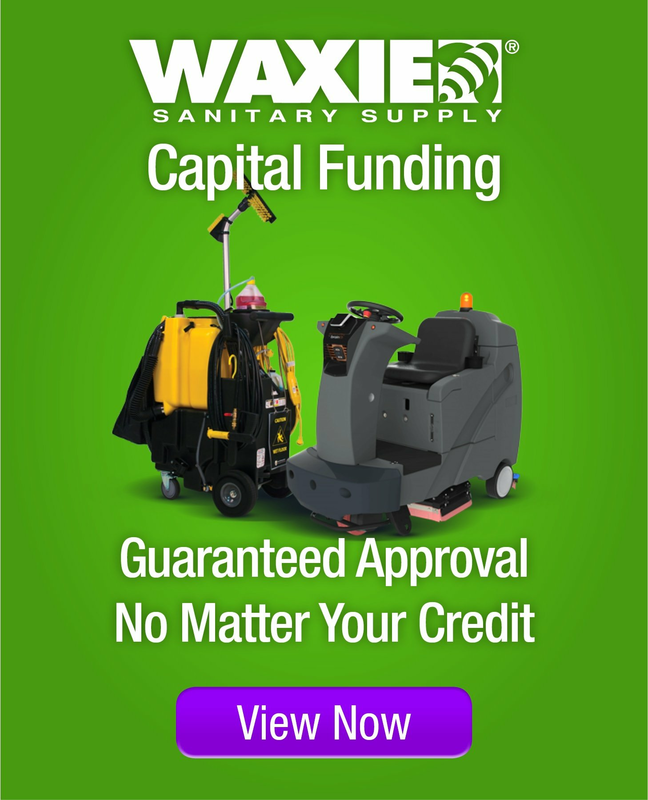 SACRAMENTO, CA – WAXIE Sanitary Supply is pleased to announce its recent acquisition of Sac-Val Janitorial Sales and Service, Inc., a leading distributor of janitorial supplies in Sacramento, CA and the San Francisco Bay Area. “We are excited about our three new locations in the State of California as this purchase will strengthen our position in the region,” said Jeff Roberts, President and COO of WAXIE Sanitary Supply. Under the leadership of President and Owner, Tom Mekeel, Sac-Val has enjoyed a 43-year record of success in the Northern California region. Combined with WAXIE’s 73-years as an industry leader, the two companies are joining forces to establish a stronger presence and service posture. Left to right: WAXIE Chairman & CEO Charles Wax, Seattle Co-Sales Consultant of the Year, Hannah Cho, and Seattle Co-Sales Consultant of the Year and 2017 Chairman Award Winner, Kevin Getman. The Chairman Award recognizes one of the nine WAXIE Branch Sales Consultants of the Year as the top overall sales performer. SEATTLE, WA, May 11, 2018 – WAXIE Sanitary Supply held a Sales Award Ceremony on February 9th at the beautiful and inspiring Seattle Aquarium located at Pier 59 in downtown Seattle, Washington. People from all over the Pacific Northwest gathered at the festivities to celebrate several of WAXIE’s regional branch achievements. WAXIE Seattle leadership along with Chairman & CEO, Charles Wax; President & COO, Jeff Roberts; and Executive Vice President of the Intermountain Region, Clint Hunter, paid tribute to the sales accomplishments of the vastly talented teams representing the offices of Anchorage and Fairbanks, Alaska; Portland, Oregon; and Seattle, Washington. The compost, recycling and landfill stations set up by WAXIE and EcoSafe. Inglewood, CA, April 25, 2018 – In a joint effort, EcoSafe National Manager Jason Sanders, EcoSafe Regional Program Manager Daniel Redick, and WAXIE Senior Account Consultant Jeff Kothe worked alongside school staff to drive sustainability efforts at Beulah Payne TK-6 Elementary School in Inglewood, California. The partnership successfully eliminated waste through student education and streamlined waste management. Left to right: Charles Wax, Chairman & CEO; Mike Midas, Executive Vice President for the Northern California, Pacific Northwest and Colorado regions; Jeff Roberts, President & COO. SAN DIEGO, CA, April 10, 2018 – WAXIE Sanitary Supply announces the promotion of Mike Midas to Executive Vice President for the Northern California, Pacific Northwest and Colorado regions. Mike has been with WAXIE for 12 years. During his tenure, Mike has led the Portland branch through a start-up phase and has also been a part of acquiring WAXIE’s Seattle and Alaska branches. For the past seven years he has been the General Manager for the Colorado branch and he has led the region to impressive growth, expanding the WAXIE brand and presence throughout the state. Mike’s success is founded on hard work as well as his ability to connect on a personal level with every employee in a way that motivates them to bring their best to WAXIE. Left to Right: Rick Jones, Vice President, General Manager of the Pacific Northwest Region; Steve Thomas, Vice President, Corporate Accounts; Eric Frei, Vice President, General Manager of the Arizona region. SAN DIEGO, CA, March 16, 2018 – WAXIE Sanitary Supply recently announced the promotion of three key employees: Rick Jones, Steve Thomas, and Eric Frei. With combined experience of over 60 years in sales, management, and operations, the three of them have played a pivotal role in shaping WAXIE’s impressive growth over the past couple decades. Left to Right: Dave Helmick, Director of Operations, WAXIE Las Vegas; Aaron Lee, Director of Operations, WAXIE San Diego; Eric Cohen, Vice President, Supply Chain.